Austerity, the Paradox of Thrift and a great graph. The notion that individual savings rather than spending can worsen a recession, or that individual saving is collectively harmful. This idea is generally attributed to John Maynard Keynes, who said that consumer spending contributes to the collective good, because one person’s spending is another person’s income. Thus, when individuals save rather than spend, they cause collective harm because businesses don’t earn as much and have to lay off employees who are then unable to save. Therefore, an increase in individual savings rates is believed to create a flattening or diminishing of the total savings rate. Clearly, the ‘paradox of thrift’ applies equally whether individuals are saving, paying off their debts or having their wages are undercut… in all these situations, spending contracts, demand falls, and businesses lay off workers and/or stop investing. The effect is a positive feedback loop which deepens the recession. It is important to note that the paradox of thrift is a theory, not a fact, and is widely disputed by non-Keynesian economists. One of the main arguments against the paradox of thrift is that when people increase savings in a bank, the bank has more money to lend, which will generally decrease the interest rate and spur lending and spending. So that’s worked well hasn’t it … Big businesses are estimated to be holding back £700+billion, whilst SMEs continue to struggle to obtain finance from the banks, for day to day cash flow, or expansion. Furthermore, individuals are not saving. Where possible, they are cutting back and trying to pay off their debts which again reduces demand. The ‘crowding out’ of the private sector by the public sector has been well and truly shown to be mythology. False economy have added to their impressive collection of posts and factsheets, two of which are re-posted here. The first is ‘5 things you need to know about welfare cuts and the economy’, and the second is a piece by Brendan Barber, the outgoing Trades Union Congress leader ‘The great wages grab: how the share of the economy going into wages has shrunk’. Together, with the ‘great graph’, they show how George Osborne is helping the stoke up the recession with his policies. In a recession people lose their jobs, businesses stop investing and the economy risks a downward spiral.But social security, benefits and tax credits kick in, propping up incomes and acting as ‘automatic stabilisers’. Government spending increases temporarily to ensure people still have money to spend on basic needs. This means businesses have customers,keeping the economy stable and preventing a terminal spiral of decline. to cutanother £10bn from welfare. This will not just be a social disaster, it could cut a further 1% off the economy, meaning a longer depression, a larger deficit and more debt for Britain. As people struggle to pay rent and bills, new research by the TUC shows how the share of the economy going into wages has continued to shrink. Despite the crash, the economy has almost doubled in size over the last thirty years. But most people at work have been cheated out of their fair share of that growth. Since the start of the 1980s, the share of the economy going to wages has shrunk. And those with the highest salaries have done better than those below them. The result is that average workers now get a smaller section of a smaller pie. 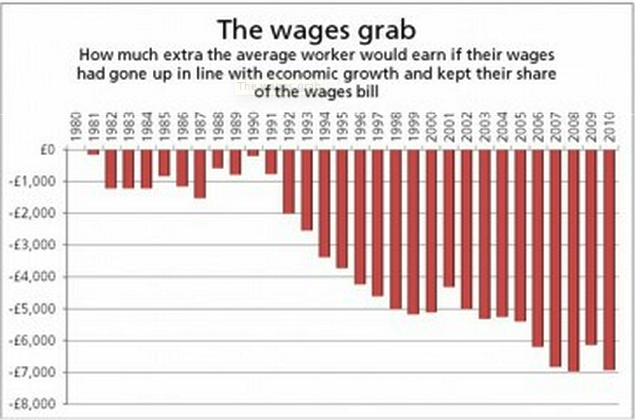 New research by the TUC reveals that the wage grab is now running at £7,000 a year. The average full-time worker is now paid around £26,000 a year. But if wages had grown in line with economic growth, and if the gap between those right at the top and the rest had not increased, the average worker would now be getting £33,000 a year – a £7,000 pay rise. This is not just unfair, but bad for the economy as it holds back growth. Companies need customers with cash in their pockets. That is why the UK economy is scraping along the bottom. Employees are cutting back as their living standards are squeezed. And the public sector, far from making up the gap, is slashing spending too. But this wages squeeze was a prime – or should we say sub-prime – cause of the crash. Excess profits and bonuses went into the finance system rather than new investment. Workers deprived of proper pay borrowed to make up the difference. And when bankers stopped considering risk before lending, we had started the inevitable slide to the global crash. Of course the wage share of the economy will change from year to year. But for 30 years after the Second World War, it was relatively constant. In the 1970s, during the oil shock and high inflation, it was arguably too high, but then fell back. That is why we have taken 1980 as our starting point. That is also when we started the three decades of deregulation, growing inequality and letting the market rip that led to the crash. It was when governments stopped caring about industrial policy or balancing the economy. And when the cult of the ‘private sector knows best’ began. The austerity economics of this government fails to learn why the economy crashed. Ministers want to go back to business as usual, continuing to hold down the wages of ordinary employees. Of course we cannot close that wage gap overnight, nor deny the difficult challenges economies face after the crash. But current policies fail to understand the causes of our problems or to set out how to build an economy that delivers decent jobs, wages and prospects for all our citizens. That is why on 20 October we will bring hundreds of thousands of people to London to argue for an alternative to austerity. The great Graph produced by the TUC shows how much the average worker has lost because wages have not kept up with growth over the last thirty years… the last thirty years being the years of TINA, Mrs Thatcher’s ‘There is no alternative’. The “missing income” went to profits and investment returns, of course. The trouble was with profits concentrated in very few hands and wages widely spread people couldn’t afford to buy the products that were being made without borrowing back the wages they’d lost from the people who’s taken them from them with the result that debt skyrocketed and recession followed. And the tax take fell too as profits are taxed less than wages. In other words, government ‘thrift’ (austerity policies), banking ‘thrift’ (not lending) and corporate ‘thrift’ (squeezing wages to increase profitability) are the causes of the current economic failure. Therefore, increasing government spending, a nationalised bank(s), a debt jubilee, closing of tax haven loopholes and a redistribution of wealth are the way forward. In fact, everything that is the very opposite of what George Osborne is actually doing… so what is he playing at? Austerity is justified by the dubious structural deficit but he is actively increasing it .. so it seems that there is a very different agenda from the one with which we are presented. This entry was posted in Economics, Employment, Topical News, Uncategorized and tagged benefits, Brendan Barber, economy, False Economy, George Osborne, Inequality, Low Wages, Protest, Richard Murphy, Touchstone, TUC by syzygysue. Bookmark the permalink. Very interesting analysis which suggests that it was the first few years of Margaret Thatcher’s government which were significant in facilitating the current ‘missing income’ identified by the less sophisticated TUC methodology.